IPL 2019 Match 31 -MI VS RCB this one is a clear win for MI despite the previous loss in the match against RR. RCB will try their A game to get their 2nd win of the season. 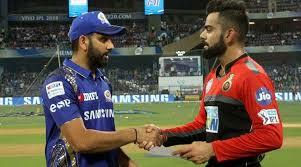 Mumbai Indians are full ready to get Royals of Bangalore in their home ground. MI have lost their previous match to Rajasthan Royals with many edges but RCB had their first win against KXIP in this whole season. RCB is still hoping to end the game with some points on VIVO IPL point’s table season 2019. This match will be played and hosted at Mumbai Indian’s home ground Wankhede Stadium at 8:00 PM (IST). The crowd will go nuts as they are hoping for another win on this pitch. Pitch is to be more into batting and for bowling it could cost a lot. Wankhede Stadium is entirely depending on the dew factor of the city. This has been causing trouble for the overseas players to play on it and in this match dew will be at its highest point during the match. Toss will be a huge factor in gaining any score and leading the way. Both the teams will be playing with some combination of the players as of the previous match. MI have lost the game but their spirit is high and will play along while after the first win straight from six losses morale of the RCB have raised. The most player will be the same as the previous games as no injuries updates have been recorded. Despite the loss in previous matches, MI has more points and stamina to find the gap for win and RCB will thrive for another win as if they lost this will be their 7th defeat. As per of previous analysis head to head counts for these two teams are 26 matches in which 17 wins are for MI and 9 for RCB. Most chances and winning bet is upon Mumbai Indians as it’s the 26 head to head with RCB and with previous records they got more wins in their hand while RCB has only one win of this season till now. Mumbai Indians are struggling but yet they have good points on the standings.